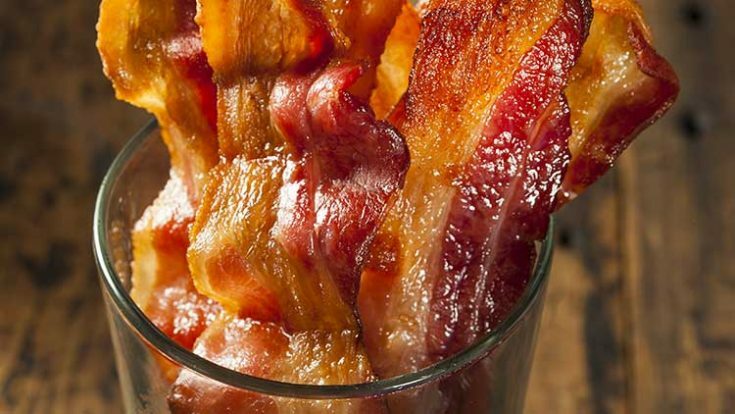 Did you know that preparing bacon doesn’t have to mean standing over the stove with bacon grease spurting at you? Learning how to cook oven fried bacon means learning an easier way to cook bacon. And that is why I love kitchen hacks, and this one is a WIN! We especially love Oven-Fried Bacon when we use our new baking bacon pan. It has amazing results. Like less grease and paper towels because the bacon grease drains while the bacon is baking. I love bacon, but I seriously CANNOT cook it the good old fashioned way. I don’t know why… I just don’t click with cooking bacon on the stove. And let’s face it. Bacon goes so good with breakfast entrees like Overnight Southwest Breakfast Casserole and Cheesy Breakfast French Toast with Berries, as it does with just about everything else. Oven Fried Bacon–my life is complete! Lately, I have been using this recipe for preparing bacon. Line rimmed baking sheet with foil for easy clean up. Spread slices of bacon on the baking sheet. It is okay to overlap them. How long do you cook bacon in the oven? Bake for 20 minutes and check to see if it is done. I normally bake with a stone, and as we all know that increases cooking time. 20 minutes should about do it if you are not using a stone. Remove from oven and place on paper towels to drain grease. I love this easy way to prepare bacon! I have always loved bacon, but have to say it is one food that I absolutely hated to cook until I learned how to make Oven-Fried Bacon. I was always afraid I would either under cook it or burn it to a crisp. Or start a fire. I always lay my slices of bacon on a rack so the grease bakes off, rather than laying it in the bottom of a baking pan where it lies in all that grease. Same exact way we cook bacon in our hotel bistro.